The AG-AC120ENU Memory card recorder offers a host of advanced functions however it hase been designed for people who prefer to use only the high quality LCD instead of EFV. The lens, camera section and recorder section of this model has been significantly revamped by incorporated outstanding new technology. The 22x zoom lens boost wide coverage, from wide angle to telephoto, while cam-type zoom, focus and iris rings allow you to make manual adjustment just like with an interchangeable lens. The cutting-edge MOS image sensor and professional AVCHD PH mode both ensure high-quality Full-HD (1920 x 1080) recording. AVCHD PH mode employs the advanced AVCHD HD recording format. It supports the high-image quality Full-HD (1920 x 1080) recording at a bit rate of 24 Mbps (average: 21 Mbps. The AG-AC120ENU also records SD video in a DV-format file (AVI Type 2) for added flexibility. Standard DV output (IEEE) lets you upload files to a PC or Mac. The AG-AC120ENU features three progressive-compatible U.L.T (Ultra Luminance Technology) image sensors (1/3-type 2.2 megapixel MOS sensor) that is used in broadcast P2HD camera recorders. This image sensor offers high sensitivity and low noise, to enable shooting in low-light conditions. 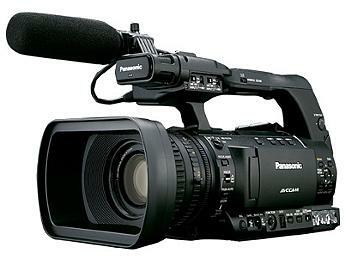 In Professional AVCHD PH mode, they can record high-quality Full-HD images. This remarkable recorder is equipped with a newly designed, large diameter zoom lens, with a filter diameter of 72mm. The 22x zoom lens covers a wide field of view, from wide-angle to telephoto, without a conversion lens. The lens is provided with three rings - a mechanical (cam-type) zoom ring, a focus ring and iris ring - for the same kind of manual operation that you get with an interchangeable lens.